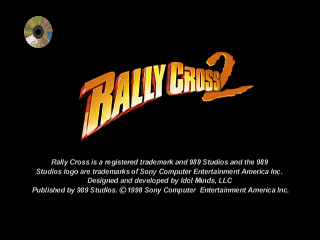 Rally Cross 2 is the sequel to Rally Cross. 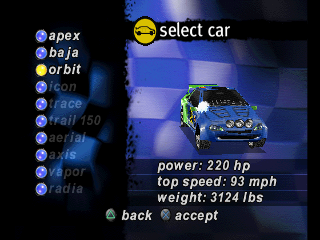 The game features different vehicles all with different stats. The physics aren't as wonky in the first, and your vehicle doesn't flip as easily as it did in the first game. 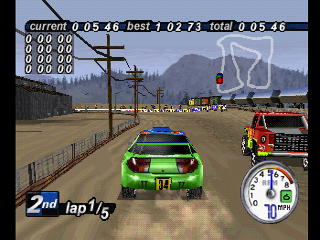 The game features varied tracks with dirt, snow, road, mud. The game features little details like mud appearing on your vehicle as you drive through it. 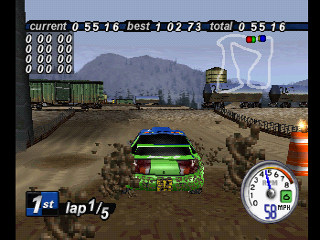 Rally Cross 2 also has a hard rock guitar soundtrack similar to the first game. While the game isn't horrible, it doesn't live up to the charm, the first game had. Overall not bad, but not great either. 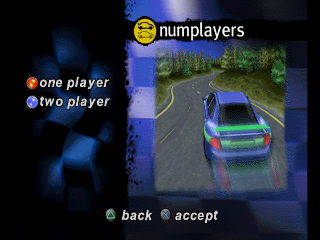 Give it a shot if you're a die-hard fan of racing games. Now you can add videos, screenshots, or other images (cover scans, disc scans, etc.) for Rally Cross 2 [U] to Emuparadise. Do it now! If you haven't noticed yet, we have a retro game of the day feature (top-right of the screen) wherein we feature a new retro title every single day! Now, you can vote for your favorite games and allow them to have their moment of glory. Click on the button below to nominate Rally Cross 2 [U] for Retro Game of the Day.